Over the same period, the total number of monks and nuns in the Order decreased by about 15%. There are on average 25 members per community – less than half those in former times. As of 1 January 2018, there were 1,796 Trappist monks and 1,592 Trappistine nuns across the world. As of 2018, there were 168 Trappist monasteries and convents. Caldey Abbey is an abbey of the Trappists situated on Caldey Island off the coast of Pembrokeshire, Wales, south of Tenby. Caldey Island has been known as one of the centres of Cistercian activity since Celtic times and thrived during medieval Europe. However, the current abbey was built in 1910 by Anglican Benedictine monks. At the time of building, the abbey was called "the greatest phenomenon in the Anglican community at the present time". The abbey passed to the Trappist order in 1929. As of 2018, there are about 10 members. They are known for their lavender perfume, shortbread and chocolate production, and opened an online shop in 2001. The Abbey came under scrutiny in 2017 when some historic instances of child abuse emerged. Charles Eugène de Foucauld, Viscount of Foucauld, born on September 15, 1858 in Strasbourg (France), died on December 1, 1916 in Tamanrasset (Algeria), was a cavalry officer in the French army, then an explorer and geographer, and finally a catholic priest, hermit who lived amongst the Tuareg in the Sahara in Algeria. He was assassinated in 1916 and is considered by the Catholic Church to be a martyr. His inspiration and writings led to the founding of the Little Brothers of Jesus among other religious congregations. He was beatified on 13 November 2005 by Pope Benedict XVI. Orphaned at the age of six, Charles de Foucauld was brought up by his maternal grandfather, colonel Beaudet de Morlet. He joined the Saint-Cyr Military Academy. Upon leaving the Academy he opted to join the cavalry. He thus went to the Saumur Cavalry School where he was known for his childish sense of humour, whilst living a life of debauchery thanks to an inheritance he received after his grandfather's death. He was assigned to a regiment. At the age of twenty-three, he decided to resign in order to explore Morocco by impersonating a Jew. The quality of his works earned him a gold medal from the Société de géographie, as well as great fame following publication of his book "Reconnaissance au Maroc" (1888). Once back in France, he rekindled his catholic faith and joined the cistercian trappist order on January 16, 1890. Still with the Trappists, he then went to Syria. His quest of an even more radical ideal of poverty, altruism, and penitence, lead him to leave the Trappists in order to become a hermit in 1887. He was then living in Palestine, writing his meditations that became the cornerstone of his spirituality. Ordained in Viviers in 1901, he decided to settle in the Algerian Sahara at Béni Abbès. His ambition was to form a new congregation, but nobody joined him. He lived with the Berbers, adopting a new apostolic approach, preaching not through sermons, but through his example. In order to be more familiar with the Tuareg, he studied their culture for over twelve years, using a pseudonym to publish the first Tuareg-French dictionary. Charles de Foucauld's works are a reference point for the understanding of Tuareg culture. On December 1st 1916, Charles de Foucauld was assassinated at his hermitage. He was quickly considered to be a martyr and was the object of veneration following the success of the biography written by René Bazin (1921). New religious congregations, spiritual families, and a renewal of hermeticism are inspired by Charles de Foucauld's life and writings. His beatification process started only eleven years after his death, in 1927. It was interrupted during the Algerian War, resumed later, and Charles de Foucauld was declared Venerable on April 24th 2001 by Pope John Paul II, then Blessed on November 13th 2005 by Pope Benedict XVI. Slaughtering animals for food is often done without the trinitarian formula, although the Armenian Apostolic Church, among other Orthodox Christians, have rituals that "display obvious links with shechitah, Jewish kosher slaughter." The Bible, states Norman Geisler, stipulates one to "abstain from food sacrificed to idols, from blood, from meat of strangled animals".In the New Testament, Paul of Tarsus notes that some devout Christians may wish to abstain from consuming meat if it causes "my brother to stumble" in his faith with God (cf. 1 Corinthians 8:13). As such, some Christian monks, such as the Trappists, have adopted a policy of Christian vegetarianism. In addition, Christians of the Seventh-day Adventist tradition generally "avoid eating meat and highly spiced food". Christians in the Anglican, Catholic, Lutheran, Methodist, and Orthodox denominations traditionally observe a meat-free day, especially during the liturgical season of Lent. Timothy Clement Smyth (February 24, 1810 – September 22, 1865) was an Irish born 19th century bishop of the Catholic Church in the United States. He served as the second bishop of the Diocese of Dubuque following the death of Mathias Loras. 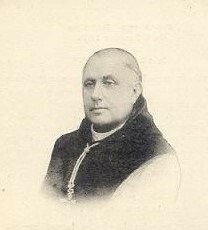 Franciscus Janssens OCist (born Albert Henri Lucien; 20 February 1881 – 23 April 1950) was the 76th General Abbot of the Common Observance between 1927 and 1936. Justo Gallego Martínez (also known as Don Justo) (born 20 September 1925 in Mejorada del Campo) is a former monk who has been constructing a cathedral-like building on his own in the town of Mejorada del Campo in the Community of Madrid, Spain, since 1961. Don Justo has named the building Nuestra Señora del Pilar. It has neither any planning permissions, nor the benediction of any church authority. Mariawald Abbey (German: Abtei Mariawald) was a monastery of the Trappists (formally known as the Cistercians of the Strict Observance), located above the village of Heimbach, in the district of Düren in the Eifel, in the forests around Kermeter, North Rhine-Westphalia, Germany. In September 2018, last monks left Mariawald Abbey and the monastery should be sold. Dom Martinus Dom, O.C.R., (24 December 1791 – 9 December 1873) was a Belgian Trappist monk. He served as the first abbot of the Trappist Abbey of Westmalle, where he founded the Westmalle Brewery. Nicholas Kao Se Tseien O.C.S.O. (traditional Chinese: 高師謙; simplified Chinese: 高师谦; pinyin: Gāo Shīqiān; 15 January 1897 – 11 December 2007), was a Chinese Roman Catholic priest living in Hong Kong who had been the oldest living Catholic priest and was the oldest ever person to have had a cataract operation according to the Guinness Book of World Records. Soligny-la-Trappe is a commune in the Orne department in north-western France. Soligny-la-Trappe is the location of La Trappe Abbey, where the Cistercian Order of the Strict Observance, or Trappists, was founded in 1664 by a converted courtier named Armand Jean le Bouthillier de Rancé. Sremič (pronounced [ˈsɾeːmitʃ]) is a dispersed settlement in the hills north of the town of Krško in eastern Slovenia. The area was traditionally part of Styria and is now included with the rest of the municipality in the Lower Sava Statistical Region.There is a small chapel in the settlement. It is dedicated to John the Baptist and was built in 1862 by the local Trappists on their land. Staouéli is a municipality in Algiers province, Algeria. It is located in Zéralda district, on a Presque-isle on the Mediterranean Sea, hosting the resort town of Sidi Fredj. There was a Grand Prix circuit located in Staouéli. Grands Prix were held there from 1928–1930, but the circuit is no longer operational.In 1843 the Trappists obtained a grant of 2500 acres of land on the site of the Battle of Staouéli (fought on June 19, 1830 during the French conquest of Algeria). Here they have built a monastery where some 100 monks lived and worked. On the wall of the monastery is the inscription: S'il est triste de vivre à la Trappe, qu'il est doux d'y mourir (While it is sad to live here, it is sweet to die here). Tarrawarra is a town in Victoria, Australia, 45 km north-east of Melbourne's central business district. Its local government area is the Shire of Yarra Ranges. It was originally known as View Hill estate, and was purchased in 1893 by David Syme, owner and publisher of The Age newspaper, who expanded it and gave it its present name, which is of Aboriginal origin. The name refers to "slow waters", describing the local arc in the Yarra River. The Post Office opened on 4 June 1900 and closed in 1957.Tarrawarra railway station opened with the opening of the Healesville line on 1 March 1889 and closed with the line on 9 December 1980. The station is now under the control of the Yarra Valley Railway who are working towards reopening the line from Healesville through Tarrawarra to Yarra Glen. In 1954 Cistercian Monks from Ireland purchased one section of the property comprising 1,000 acres (4.0 km2), including the large house built by David Syme for his daughter and established Tarrawarra Abbey of the Order of Cistercians of the Strict Observance (Trappists). Since that time the community has built additional buildings including a large library in 2006. The monks support themselves by operating a beef farm and by Tarrawarra Eucharistic Breads. Another section of the original estate today is TarraWarra Estate winery which opened in 1983 and which produces chardonnay and pinot noir. For the art forger of the same name, see Tom Keating. Thomas Keating, O.C.S.O. (March 7, 1923 – October 25, 2018) was an American Roman Catholic monk and priest of the Order of Cistercians of the Strict Observance (also known as Trappists). Keating was known as one of the principal developers of Centering Prayer, a contemporary method of contemplative prayer that emerged from St. Joseph's Abbey, Spencer, Massachusetts. William Meninger, O.C.S.O. is an American Trappist monk who is a noted spiritual teacher and a principal developer of Centering Prayer, a method of prayer which has become widespread throughout the world.